Before proceeding any further, let’s clear up a basic question: is it “Portuguese” or “Portugieser”? 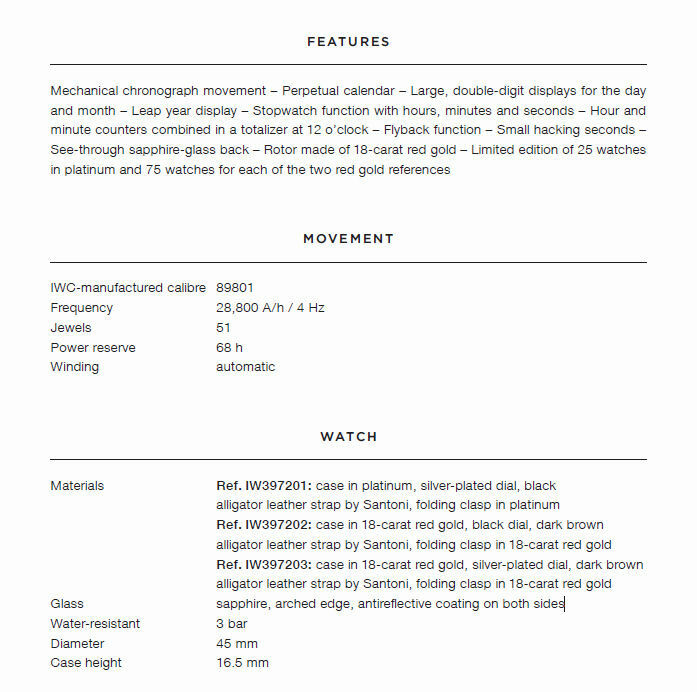 As this is written, the following sentence appears on the official IWC website: “This year, IWC Schaffhausen celebrates the 75th year of the Portugieser (Portuguese) watch family.” This creates the impression that even the manufacturer is confused. It’s not. 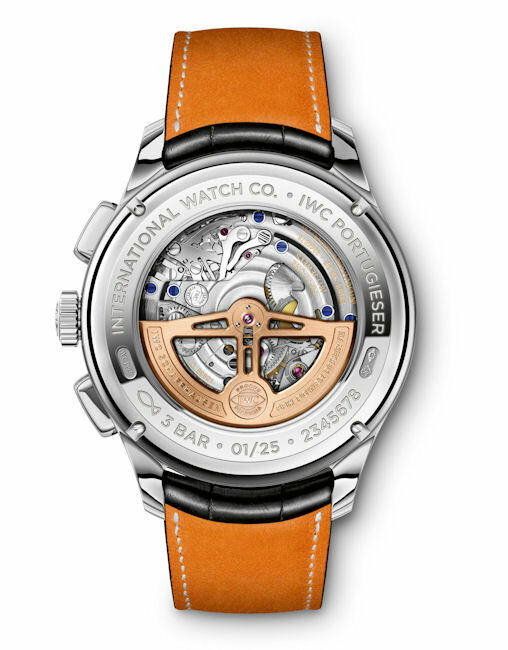 I checked with IWC, and they explained that “Portugieser” is the German spelling of “Portuguese”, just as “Ingenieur” is the German spelling of “Engineer.” Going forward, IWC will exclusively use the German spelling “Portugieser” in all markets. Having settled that issue, let’s proceed. Perpetual calendar chronographs are eminently practical collector favorites. Though the caliber 89801 powering this new model is not entirely new, it has some new updates, and it incorporates some impressive technical innovations. In the world of complicated movements, simplicity is an underrated attribute. 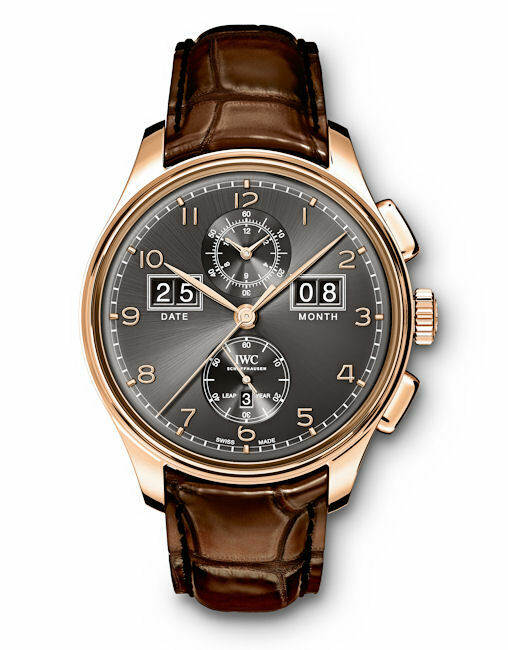 When developing the chronograph totalizers employed in this watch, IWC carefully considered how we read time displays. In that regard, nothing beats two centrally-mounted hands. 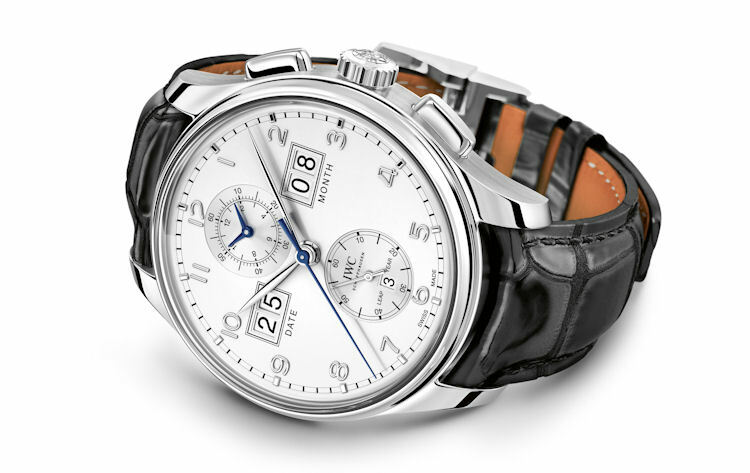 IWC’s designers applied that fundamental concept to the chronograph counters, combining the elapsed hours and minutes in a single clock-like display at 12 o’clock. This layout may make perfect sense, but technically, it’s difficult to implement, and the resolution required four years of work. We’re glad they made the effort. The analog displays were not the only ones that required lots of thinking. Rotating disks marked with digits are also easy to read, but they weigh more than hands, and they are more complicated to drive, making them power hungry. 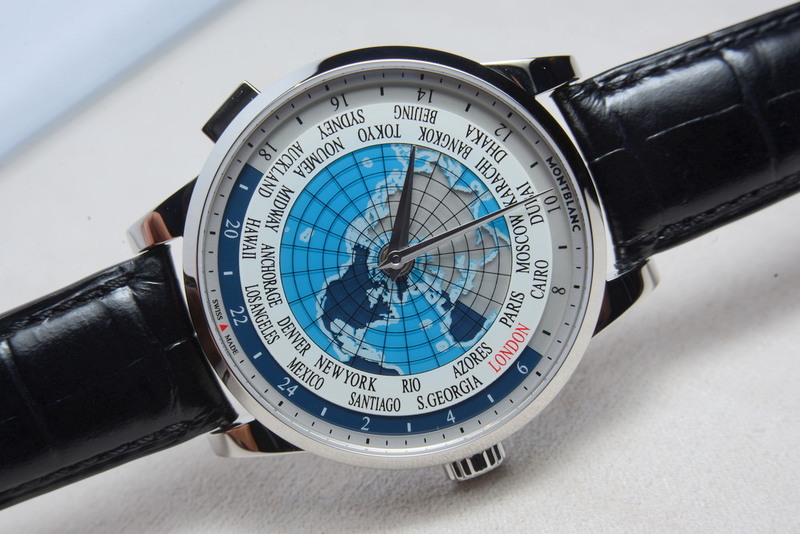 This is especially true for oversize displays, of which this watch has two. The complexity of these displays is illustrated below. Consider that at midnight, or worse yet, at midnight on New Year’s Eve, several of the displays have to advance at the same time. That requires lots of energy. Now imagine that you want to check the accuracy of the countdown timer on the big ball in Times Square, so a minute or so before midnight, you start the chronograph. 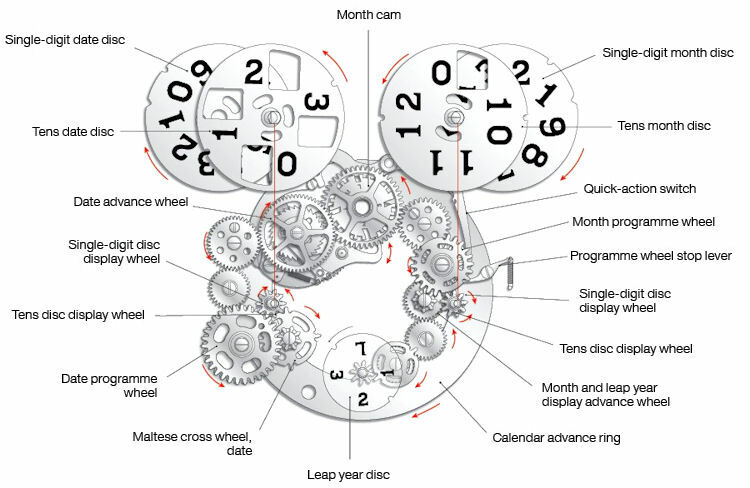 At the moment the new year begins, the entire watch dial is in motion – six hands advance while three large disks, and one smaller one, move forward. Where did IWC find the power to make all of this happen? The secret is a second energy source, the so-called quick-action switch. Every night, when the date display moves forward, the switch siphons off a little of the energy and stores it, then discharges it precisely at the end of the month or year when, in addition to the date and month disc, the leap year disc also advances. 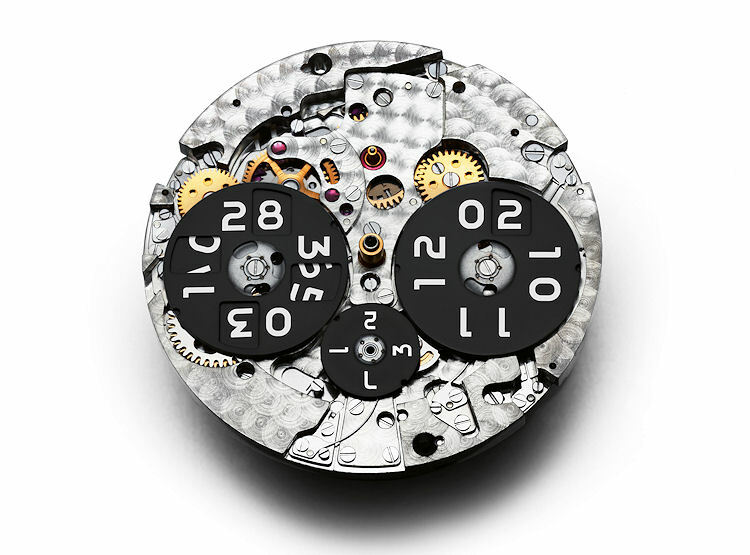 To charge the mainspring that provides all of the power, IWC has developed an especially efficient double-pawl winding mechanism. In this assembly, four pawls arranged diagonally to the pawl wheel – in other words, two sets of double pawls – convey the push-and-pull motion from the rotor to the barrel. This solution eliminates dead spots during winding and boosts the system’s efficiency by a claimed 30 percent. Finally, for 2015, the IWC-manufactured 89801 caliber has some new features: the rotor and the “Probus Scafusia” medallion are now slightly more delicate in design and made of solid red gold. Other new highlights include decorative blued screws, which together with the red jewels and the Geneva stripes create an impressive technical tableau. 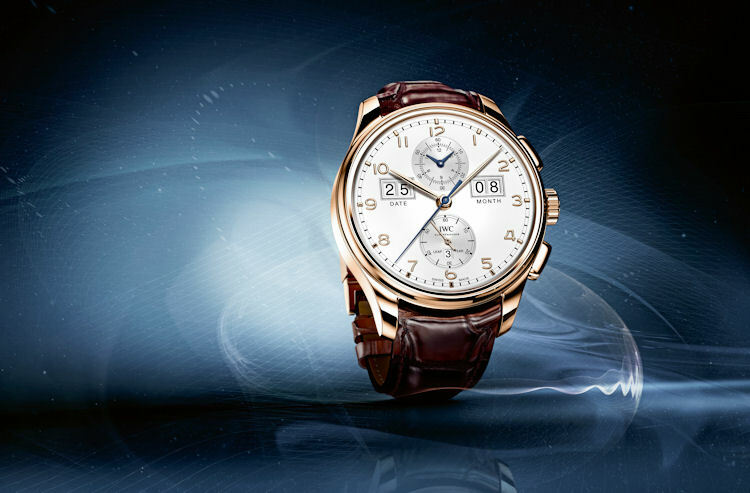 The Portugieser Perpetual Calendar Digital Date-Month Edition “75th Anniversary” is limited to 25 pieces in platinum and 75 pieces each in 18k red gold with either a black or a silver-plated dial. The cases measure 45 x 16.5 mm, and each watch is fitted with an alligator strap by Santoni. As we go to press, IWC has not released pricing on these watches, though we do know that they will be available in April, they will be available globally, and they will not be boutique exclusives. Complete official specifications appear below.